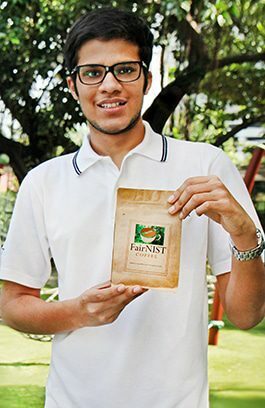 FairNIST Coffee is a student led social enterprise that offers premium grade coffee, built on the broader goal of improving and aiding Maeramit village in Omgoi, a remote part of Chiang Mai province. Every cup of coffee at our school is made from FairNIST coffee beans. One of the student leaders, Nikhil Goyal, offered his thoughts on the development of the group. How did FairNIST start and what is its goal? FairNIST began as an offshoot of the Maeramit Development Group after a needs analysis determined that Maeramit had a lack of agricultural income. We also found that the farming environment surrounding the village was ideal for growing coffee, mainly due to its dense mountainous forest, abundant shade and black, nutrient-rich soil. This made coffee an easy choice and perfect solution from an agricultural and business standpoint. Our goal is to help improve the Maeramit community through raising money in the short term, while also aiming to invest and create a sustainable long term project for the benefit of the villagers. Once we have enough capital raised, we plan to train and supply the farmers with the means to secure their agricultural and thus financial future. What is the motivation behind FairNIST? Personally, as I’m also involved with the Model United Nations, I believe that it is important to get beyond the typical model of lots of talk, but not much actual work being done. FairNIST is a great opportunity for me to show that I truly understand the conversations within the Model United Nations by taking the initiative and tackling the problem head on. I’m very passionate about the chance to help run a social enterprise that directly addresses the problems raised by the Model United Nations. One of the big challenges was finding the right partners. We were very fortunate to find the right organizations after contacting numerous businesses and individuals, and also by attending tradeshows. Our partners, Roots and Thai High Coffee, have been extremely helpful not only in their service, but also through imparting their knowledge, skills and expertise. For us students, we don’t have M.B.A.s or management experience. But by having helpful business partners, it gives us a big advantage, as they are willing to help guide us. This is especially beneficial since the Thai coffee industry is very dynamic. It has its challenges, though it also has great opportunities. What makes the coffee unique? FairNIST coffee is made from a special blend that is exclusive to NIST. A lot of research and taste testing has been done to ensure that we can deliver the best possible cup of coffee. The blend is an aromatic, delicately roasted, chocolaty, full-bodied coffee that is roasted and processed professionally. A lot of care has been taken through every step of the way to ensure a successful product and successful project. What is your favorite cup of FairNIST? My personal preference is a hot Americano.